In helpful response to the “stubbed toe” picaresque printed yesterday (and just below) Ron Edge – more often known here for his “Edge Clippings” – sends along the above with this note. “This 1937 aerial has a few of the landmarks you mention on your blog posting, including a good view of the golf course.” Surely. Where once little white balls were hit about now gallbladders are removed. The new addition to University Hospital was snapped by me over the hedge on monday last at the lower-right corner. 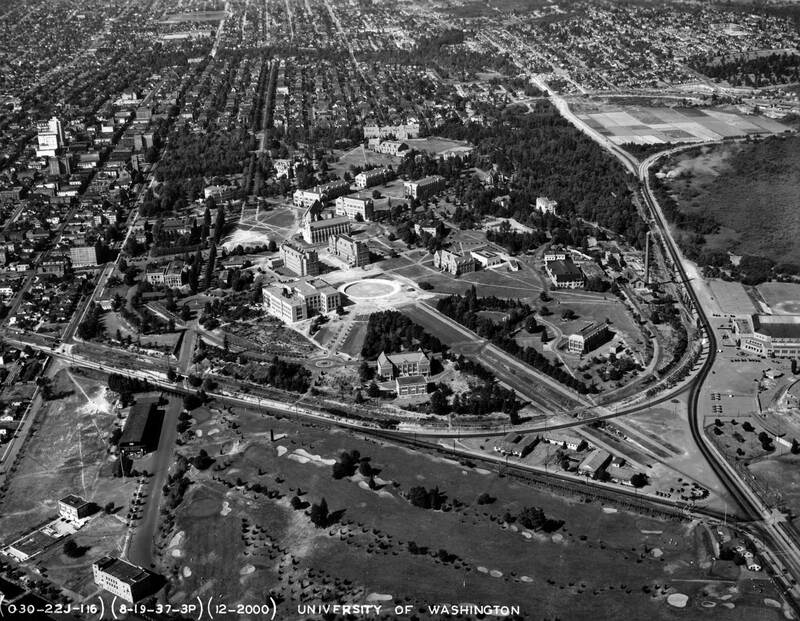 15th Avenue is far left and the next avenue to the right of it is what was in 1937 still an open section of the campus’ Stevens Way. It passes under a Seattle Lake Shore and Easter RR (Northern Pacific) viaduct (Burke Gilman Trail) that is still there. 100 years ago that extended avenue was the promenade for the 1909 Alaska Yukon and Pacific Exposition’s carnival side, The Pay Streak. (The Sunday after next we will feature here a lot of AYP pictures in a “wrap-up” – a film term I think – of the summer-long centennial.) The big and long south campus buildings that I did not name in “stubbed toe” are the Stronghold and William H. Foege Genome Sciences buildings – if I have read the U.W. Map I have now consulted correctly. These new health sciences buildings are east of a 15th Avenue that was freshly redirected to the southwest to make room for them. Only a wee bit of the old residential neighborhood west of 15th shows in the aerial, but one can find that northwest corner of 41st and 15th shown in “stubbed toe”, and discover a five story apartment there in 1937. Again, I don’t remember it. And notice how in 1937 forty-first ave. continued directly on to the campus. One block north the big and white Wesley student center is easily spotted at the northwest corner of 15th and 42rd, with the Methodist church just beyond it at 43th. Two blocks more (there is no 44th St. in this section) is the old Presby church, the brick block at the southeast corner of 47th and 15th. (It is hard to make out but it is there.) The new red brick Gothic structure that took its place and more dates from the early 50s. Turning west on 47th and continuing on to Wallingford there is no Baptist church to be seen. It is hidden behind the Meany Hotel and General Insurance Co. (Safeco) buildings. The aerial looks as far north as the reservoirs around 75th. The green belt of the Ravenna and Cowen Parks ravine intercedes. Calvary Cemetery is upper right and below it are the nursery fields in the rich soil of what is now the concrete spread of University Village. Below that at the curve where Montlake Blvd NE turns into NE 45th Street one can glimpse a tiny (very) early example of the fill work on the old Lake bottom (dropped 9 feet in 1916 for the opening of the ship canal) that will eventually turn those acres to driving more golf balls, parking, and playing games of many kinds. Thanks Ron.